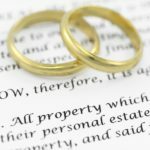 Estate Planning Tool: Marital Property Agreement - Ruffi Law Offices, S.C.
Wisconsin is a marital property state. Marriage is considered a partnership, and married spouses are generally treated as though they share equally in most assets. Each spouse is presumed to own an undivided one-half interest in all marital property. For example: If Mary and Glenn own $100,000 of marital property, upon Glenn’s death, Glenn’s estate owns $50,000. Mary owns $50,000 by right of marital property. A marital property agreement ensures the classification of property. This is especially important in light of potential tax conscious estate plans. There is often a “Washington Will” provision, which allows the property to pass outside of probate or the court system. Why would I want a marital property agreement? Upon the death of a spouse, a marital property agreement can designate all property as survivorship marital property passing to the other spouse. All property can pass to a spouse outside of probate. Conflicts over what is marital property can be eliminated. A Marital Property Agreement can classify property as individual property to go to children from prior marriages. It can assist with gifting specific bequests, or specific items, to third parties. A marital property agreement is one tool in an estate planning attorney’s toolbox. It can assist with a comprehensive estate plan to reach a client’s goals. A few other “tools” include wills, powers of attorney, final dispositions, trusts and other documents. If you would like to learn more information about marital property agreements, please call (715) 843-0800 and ask to talk to one of our attorneys. This article provides general information regarding marital property agreements. This article is not meant to be construed as legal advice and does not form an attorney-client relationship. This article may not apply to every case or situation. For specific legal advice for your situation, please call Ruffi Law Offices at (715) 843-0800.